For a successful stay we believe you need a friendly and comfortable environment and it is for this reason that we do our best to ensure it. We carefully select and regularly visit each accommodation. With most of them we’ve been working since the beginning. Standard, rooms are booked from the Sunday before the first course day until Saturday morning after the last day of lessons. 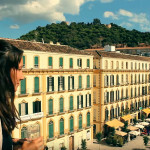 The fully equipped apartments in Malaga are shared with an average of 3 to 5 language school students. You will be provided your own room which will include all of the standard necessities: single or double bed, wardrobe, table and chair, etc. The living room, kitchen and bathroom will all be shared by the housemates. This is a great option for those looking for the opportunity to live with a variety of people sharing very different cultures. All apartments are within a 10 minutes (to 20 minutes in summer) walking distance of the school. Bed sheets are available, but you should bring your own towels. You can book a single- or a double room. Please mind that double room can only be reserved for 2 students who travel together. If you want to come together with a friend, and you want to stay in a single room in the same apartment, in most cases that’s no problem either. Please leave a note with your request on the enrolment form. 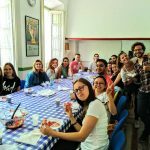 In choosing to stay with a host family students truly experience the hospitality of a Spanish family. We believe this one of the best ways to get to know Spanish culture. Having your own room and keys, students will enjoy this home-style experience yet still have the comforts of independence. But it must be understood that each student must adhere to the rules and customs of their Spanish family. Please mind that a family is not always the typical family, but can also consist of a divorced woman (with or without children) for example. The half board option includes breakfast and one meal a day, while the full board option includes breakfast and two meals a day. All host families are within a 10 minutes (to 20 minutes in summer) walking distance of the school. Bed sheets are available, but you should bring your own towels. You can book a single- or a double room. Please mind that double room can only be reserved for 2 students who travel together.